"Dog wash, talkin' about the dog wash, yeah!" 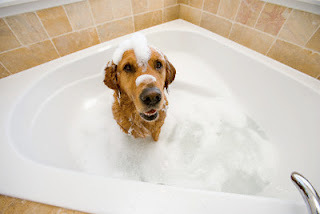 Pet Head is helping us create our own summer memories with their gentle and yummy dog shampoos and conditioners. I love how these shampoos quickly lather up even when washing coarse dog hair. The company's tearless dog shampoo "Fears For Tears" is especially gentle and contains Shea butter and safflower oil to help your dog's skin from drying. It has a Green Apple Kiwi scent. Mmmm. All the Pet Head products are pH adjusted (gentle) and free of parabens, petroleum derivatives, propylene glycol, sulfate and DEA and are cruelty free. Thanks to Ananda and good folks at Pet Head, we have a Sweet Dog GIVEAWAY! Post a comment on this blog post telling us a product you like on the Pet Head website (1 entry). Please include your email address so we can contact the winner. If you do not have a Google account, select anonymous. The winner will be selected at random. Contest Ends 06/26/09. This contest has ended. Congratulations to our Sweet Dog Giveaway winner, Miranda. Thanks to all of you who participated in the giveaway. I appreciate your support! Check back for more great product reviews and giveaways.